Our initial plan of a 4 day trip up Storoen, to start with needed to be cancelled due to late arrival of supplies. Our supplies for the entire trip didn't turn up here in Uummannaq before Friday. Hans Gundel has also been out of town, but is back Monday - National day in Greenland. We will use the following days to make individual foodpackages, one per person per day. Every element of our gear will be chekked and re-chekked. Looking south towards the face-wall of the Peninsula fills one with a sense of being a very small person. However, it's an impressive sight around 12 midnight. In just 7 days the team will be assembled in Uummannaq. All team members are looking forward to the trail. Before the hike on the peninsula, we will spend 3 - 4 days hiking up Storøen, a 1.200 meter high, and 18 kilometers long island, just 8 kilometers East of Uummannaq. This initial hike will work as a minor training exercise - a preparation to the peninsula trip. 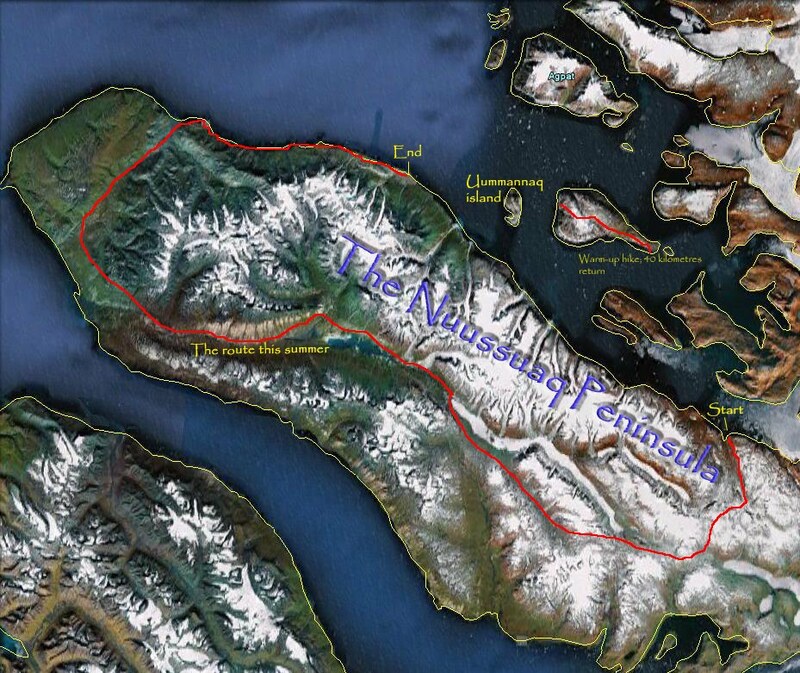 The map below presents both the initial hike, as well as our route on the Nuussuaq Peninsula.